Cheetahs and Tigers and Bears O MY! Faux fur is here and hot this season adding texture, warmth, and Ooo La La to looks around the globe. Happy Shopping & Have a Magical Day! Hopefully you have read our recent post Just Say “Yes” and learned a little about what trends are hitting the streets this fall. Fashion seems to be turning into some new and inspired styles and, if your like me, you can’t help but be anxious to test the waters; but where to start? No fear! We are here to guide you on how you can integrate these Fall 2013 trends into your personal style. We will start today with the “grunge chic” look that seems to be making a come back from the 90’s. Now before you go to your closet and “rub some dirt on it,” here are some ideas on how to pull of this rather sloppy idea in a chic and appropriate way. The image to the left is a great example of using more posh pieces in your grunge chic outfit. She wears a pair of knock-out gold slim pants with a patterned open blazer; but wait… she also has on those combat style black boots adding that touch of grunge, and looking ever so chic. A grunge chic look from the runway, we have the same idea on the right. 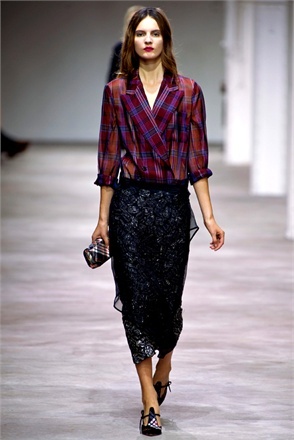 The long sparkle skirt incorporates the fall shiny fabric trend and the red and blue plaid blouse, that has a similar structure to a blazer, incorporates the grunge trend. The sheer fabric brings elegance toning down, but not eliminating the grunge factor. Taking it to the next level involves lots of layering, hats, and choosing colors like navy, hunter green, denim, black leather and deep reds. We see fur jackets mixed with graphic tees, ripped jeans, leather pants, black tights with shorts, army green jackets, leather boots and plaid flannel button downs. I love the two girls on the left. They are styled, and have a mix of fun pieces that overall pull off an amazing grunge chic look. On the more carefree and casual side for sure, but their style is not sloppy. Check our our Pinterest Grunge Chic board for more looks to love. We hope to inspire you to try the trend. Show us what you come up with and post pics to our FB page! Speaking of Fall Fashion….. Take a look at Pantone’s 2013 Fall Fashion Color Report. Its already August and September will be here in the blink of an eye. We need to start our prep work so we’re ready to take on this new season. Pantone’s color report is a survey of famous designers who give their expertise every year on what colors will be the highlight of each season. Click here to download the report, read it through, and see what these fabulous designers have to say about this years color trends. What colors are you looking forward to this fall? What are your favorite fall pieces to wear? We look forward to hearing from you! Post your answers below and enter your email to start following us today! A recent conversation with a very wise friend reminded me the power and impact of the word “NO”. Two letters, one syllable, yet so powerful. The word is so definite, so abrupt, and extremely deflating. “NO” is simply overused. When it comes to fashion, the only way to keep up is to say “YES.” How many times have you seen a new trend and thought, or said out loud, “I would NEVER wear that. What are these people thinking?” only to be buying into that same trend two months later because, oh ya it actually is cool. Been there. Sometimes we put our foot in our mouth when it comes to new styles because well, they are new and unfamiliar. As creatures of habit its what we do. New trends are always around the corner. Unless you want to turn in your “chic card,” you will need not judge and just try. What can it hurt? You may as well be ahead of the game so that when the others do catch up, they will see what you knew all along 😉 Invigorating right? Here is a list of upcoming 2013 Fall trends to look out for and start thinking about saying “YES” to. Blue Shades: Mixing different shades of blue is a huge upcoming trend; so many shades, so little time! Shiny Fabric: Metallic fabrics, glossy leather, and smooth silhouettes is a must for a fall look that shines. Super-sized Coats: You will sure be warm this winter. Over-sized outerwear is where its at. Grunge: patterns like plaid, rock inspired pieces, and irreverent prints help build this layered style. Impactful Details: Jewels, feathers, appliques and embellishments that steal the show and make the look. Structural Bags: Boxy shapes, clean lines and sharp edges is what makes these accessories sleek. I hope this gets you thinking and excited for what’s to come. 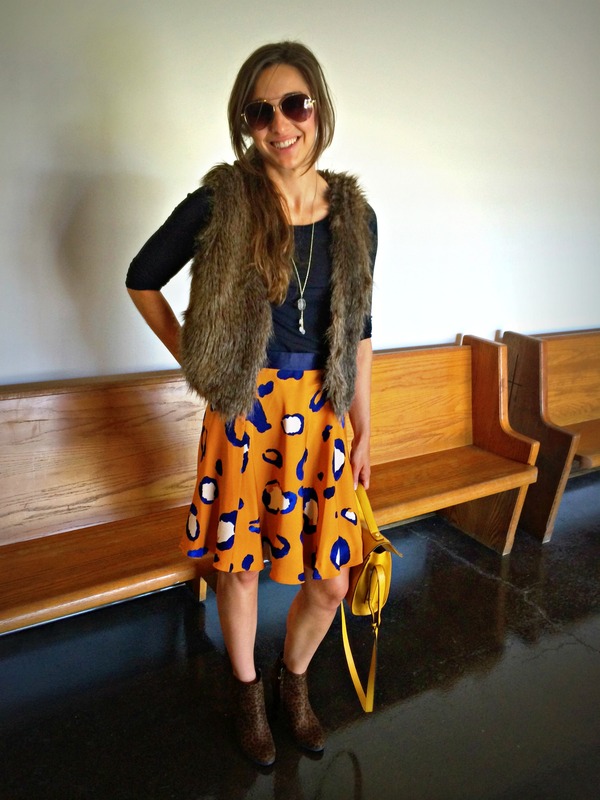 This article from FABSUGAR, “Fall Fashion Trends 2013” will give you a closer look at each trend. Tell us what trends your unsure about and which ones you are excited to say “YES” to! We can’t wait to hear so post below!! !